Is Amazon entering the wearables space? Babak Parviz, the first head of the Google Glass project team, will be joining Amazon. Parviz announced the move in an update to his Google+ profile. In addition to helping create Google Glass, Parviz, a Univ. 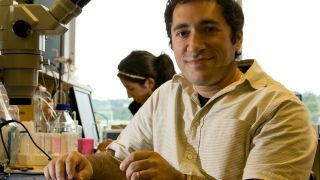 of Washington Assistant Professor, was a Google X team member who helped the organization develop the first bionic contact lenses. He holds a PhD in electrical engineering from the Univ. of Michigan, and he was a postdoctoral fellow in chemistry and chemical biology at Harvard. Parviz has also been tied to Microsoft. In 2011, the technology giant funded Parviz's research at the Univ. of Washington to develop a smart contact lens that could help diabetics monitor blood-sugar levels. Although it is immediately unclear what role Parviz will hold at Amazon, it is likely the e-commerce company is looking to move into the wearables space to add to its burgeoning tablet and smartphone business. However, if Amazon is making a move on wearables, it will be an uphill climb, as Google has an extreme head start in the field. Google Glass 2 is reportedly in development. The company has already improved the original version of Glass by equipping it with 2GB of RAM and a viewfinder designed to help users better frame photo shots. American fashion designer Diane von Furstenberg created a new collection for Google Glass that Google said will make the headset cool. In the enterprise space, Google has partnered with Salesforce to develop a tool designed for businesses to create applications on wearable devices such Google Glass, among other wearables. What does TechRadar think of Google Glass?